Since my book is coming out soon, I thought I’d show you some of the books I used in my research. (Not all of them are here as some I got through the library and I had to return them). I feel like Twilight Sparkle from My Little Pony: Friendship is Magic. I’m getting all excited (adorkable) over books! This collection has taken me over 15 years to build. I just wanted to share this with others in order to share my joy. I do not have a lot of money. I buy books new (if it is within my budget), used or on sale. (Here is an article I wrote about finding books online: Books and Where to Find Them). So anyway, without further ado, here is my Aset (Isis) and ancient Egyptian research material! 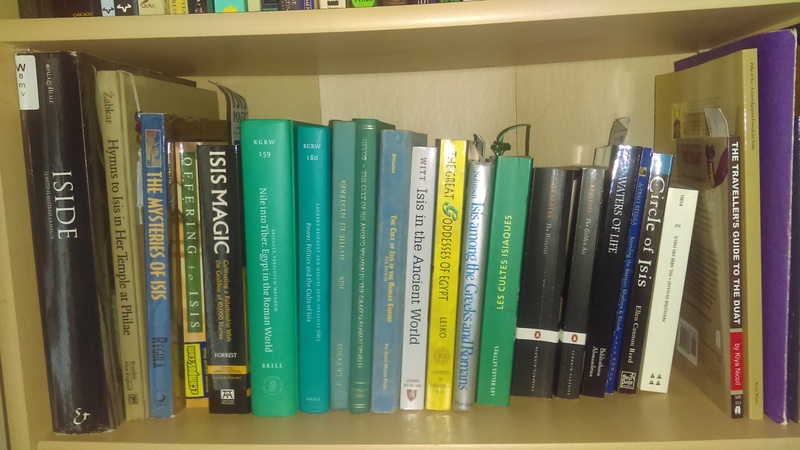 Here my is Aset (Isis) bookshelf. I have academic and modern religious works on the shelf. Many of them are listed on my Aset Reference list here: References. As you’ve probably noticed I have books from a modern religious viewpoint such as Isis Magic and Offerings to Isis by Isidora Forrest; The Mysteries of Isis by deTraci Regula; and Waters of Life: A Devotional Anthology for Isis and Serapis by Bibliotheca Alexandrina. I have some classic research material such as Hymns to Isis in Her Temple at Philae by Louis V. Zabkar and Isis in the Ancient World by R. E. Witt. I also have some other books like Les Cultes Isiaques Dans Le Monde Greco-romain by Laurent Bricault; The Cult of Isis Among Women in the Greco-Roman World by Sharon Kelly Heyob; Isis, Mere Des Dieux by Francoise Dunand; and The Great Goddesses of Egypt by Barbara Lesko. 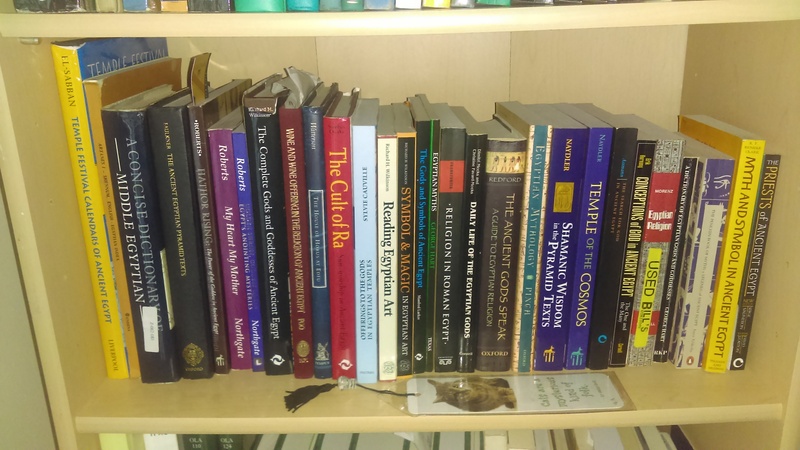 And while not necessarily specifically about Aset (Isis), these books are on that shelf too (mostly b/c I had no space): The Traveller’s Guide to the Duat by Kiya Nicoll; Pillar of Ra by Kerry Wisner; and Nebt-het: Lady of the House by Tamara Siuda. This is my ancient Egyptian religion and mythology section (and one calendar book; I couldn’t fit it anywhere else). Honorable mentions here are Egyptian Mythology: A Guide to the Gods, Goddesses and Traditions of Ancient Egypt by Geraldine Pinch; Egyptian Religion by Siegfried Morenz; Daily Life of the Egyptian Gods by Dmitri Meeks and Christine Favard-Meeks; and Temple of the Cosmos by Jeremy Naydler. I also would like to mention a more esoteric book My Heart My Mother: Death and Rebirth in Ancient Egypt by Alison Roberts. Oh, yeah. And the calendar book: Temple Festival Calendars of Ancient Egypt by Sherif El-Sabban. 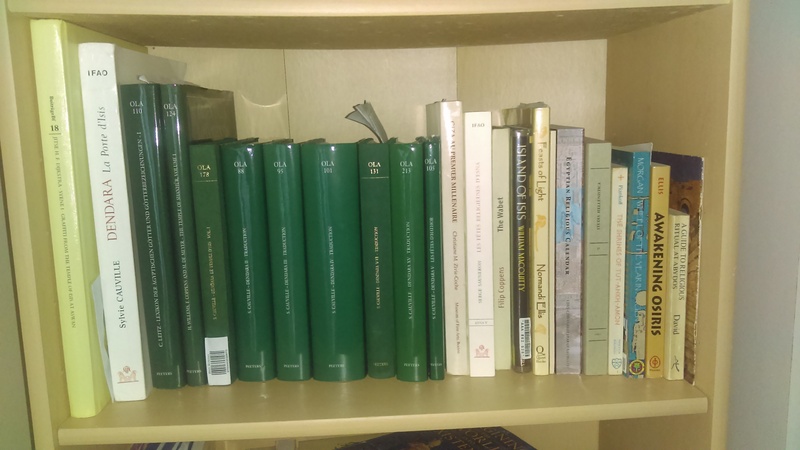 This shelf is for my ancient Egyptian Temple, Hymns, Calendar and Festivals research. 6. Giza au Primier Millenaire: Autour du Temple d’Isis Dame des Pyramides by Christiane M. Zivie-Coche. So I hope this was helpful, informative or at least interesting.